De-gunk and protect granite surfaces around the house with this all-natural DIY solvent. Homeowners gush over granite for kitchen counters, bathroom vanity tops, and other surfaces for its ability to handle heat, resist everyday scratches, and—of course—look great. But granite’s porous surface can accumulate dirt, grime, and bacteria that can sully its appearance and deteriorate the layer of clear sealant that protects it from chipping and discoloration. Not just any cleaner will do the trick, either. Alas, most “all-purpose” cleaners sold in stores are too harsh for this permeable stone. While specially formulated commercial cleansers are available at home centers (for $5 to $15), you can save cash and avoid chemicals by whipping up your own homemade granite cleaner with non-toxic, non-damaging ingredients you no doubt already have on hand. Follow this recipe to make your own all-natural cleaner and put it to use in minutes. It’s ideal for cleaning granite—and a number of other household surfaces that need gentle care. Pour one-half cup of rubbing alcohol, one-half teaspoon of dish soap, and one-and-a-half cups of warm water into the spray bottle. 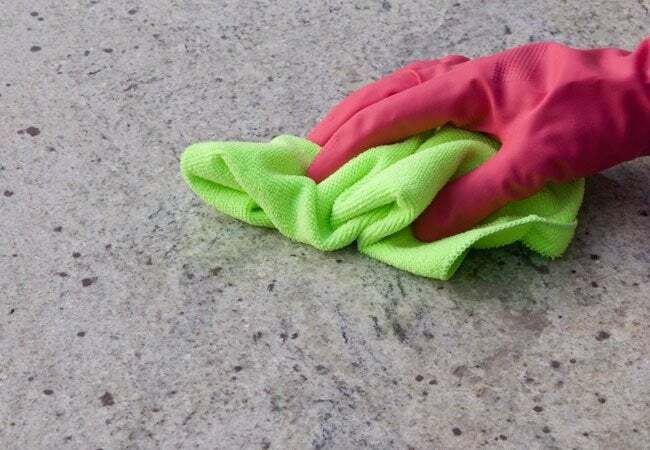 The disinfecting properties of alcohol, coupled with the de-greasing powers of dish soap, will deliver a one-two punch to banish bacteria and grime from the granite surface. If desired, add ten to 20 drops of essential oil to the spray bottle to infuse the homemade granite cleaner with a subtle fragrance that will deodorize the granite surface. Basil, lavender, and cinnamon scents are all excellent options. While acidic liquids like lemon juice can corrode sealant and make the underlying granite vulnerable to chips, citrus-scented essential oil is pH-neutral and completely safe to use on this porous stone. Secure the spray head back onto the bottle, then gently shake the bottle a few times to combine the contents. Label the bottle and store it in a dry location away from pets and children, or put it to use immediately to clean surfaces around the home. Check out these tips to get the most out of your homemade granite cleaner! • Granite countertops: Wipe down the surface with a clean microfiber cloth (avoid abrasive scrubbers like steel wool, which can scratch). Then generously spray the homemade cleaner onto the entire countertop and wipe it down with a microfiber cloth. If you still see build-up or stains on the surface, spray additional cleanser on the problem area and use a more vigorous circular motion to loosen and lift the grime. Once clean, quickly wipe up any remaining homemade granite cleaner with a microfiber cloth (allowing it to dry may result in minor streaks). • Granite flooring: The same cleaning technique as described above works for floors, but use a microfiber mop instead of a cloth to save times and keep backaches at bay. 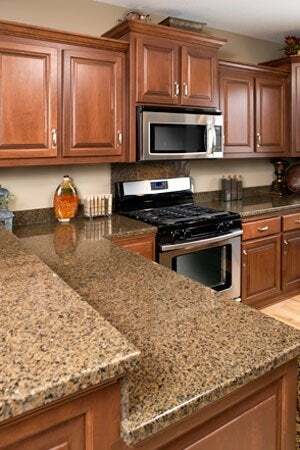 • Granite backsplashes: Use the same cleaning technique above to remove grit and grease from granite backsplashes, but avoid spraying the homemade granite cleaner on finished wood surrounding a backsplash (e.g. a kitchen cabinet), as rubbing alcohol can erode lacquer or paint on the wood’s surface. • Granite fireplace surrounds: Clear soot and fingerprints from a fireplace surround using the same technique used for cleaning countertops. • Marble and other stone surfaces: Like granite, these materials are acid-averse, but they won’t be harmed by this homemade granite cleaner thanks to its neutral pH. Clean in the same methods described above. • Small appliances: Rubbing alcohol is well-tolerated by stainless steel and plastic-coated appliances, so the diluted form in this homemade granite cleaner is safe for use on toasters, coffee makers and other essentials that easily accumulate grime. (Just be sure to use isopropyl—i.e. rubbing—alcohol in the solution, not ethyl alcohol, which can corrode plastic.) To clean, unplug the appliance and let it cool completely, then spritz the cleaner onto the appliance exterior and wipe it down with a microfiber cloth. Avoid spraying LCD displays on appliances, as rubbing alcohol in this recipe may remove the clear protective coating on the display.